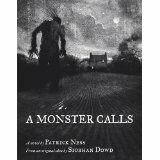 I have experienced equal quantities of dread and delight whilst anticipating A Monster Calls, a novel which is the joint venture of two highly acclaimed authors of YA fiction. I’ve been dreading it as it will be my last experience of the wonderful writing of Siobhan Dowd who died in 2007 aged 47. Siobhan was the author of four brilliant novels, two of which were published posthumously and she had penned some notes for a new book which culiminated in Patrick Ness taking the baton and producing the thing of beauty which is A Monster Calls. So was it to be a Dowd or a Ness novel, whose influence would be felt the most? To tell the truth, it’s different from anything either author has produced before. Yes, I felt Siobhan’s touch at times but this really feels like a one-off, an original masterpiece. In just over 200 pages, Patrick Ness weaves the tale of Conor O’Malley, a 13 year old only child who has a battle on his hands. His single mother is nearing the end of her fight with cancer and Conor has a well meaning grandmother whose good intentions only end up estranging him further. His father has remarried, now living in the US and is in the clutches of a jealous new wife complete with new baby and he hardly wants the added troubles of his teenage son. Meanwhile, at school, the only people who really notice Conor are the bullies – everyone else is busily tip-toeing around the elephant in the room/playground. If that wasn’t enough, a monster comes a-calling, in the shape of a yew tree – yew trees are symbolic of everlasting life and healing but this particular specimen doesn’t seem very friendly. This entry was posted on Thursday, June 9th, 2011 at 2:40 pm	and is filed under YA Fiction. You can follow any responses to this entry through the RSS 2.0 feed. You can leave a response, or trackback from your own site. I’ve been meaning to read Patrick Ness for a really long time, and this review just nudges me to start reading his works. It sounds poignant and touching – your last paragraph really sold it! My copy is suffering from water damage due to copious tears – think of it as a necessary catharsis! I have not long read The London Eye Mystery and have book 1 of Chaos Walking on the kindle so this sounds like one for me! Thanks Sarah. Annie loved the Chaos Walking trilogy and we usually like the same YA fiction so I think it will be excellent. This is a very special book. I’ve yet to read O’Dowd, although I have Bog Boy on the shelves. Have read the first two of Ness’s Chaos Walking trilogy and loved them. This book sounds a must too. Well, I’ll read The Knife of Never Letting Go if you read Bog Child, Annabel and we can compare and contrast!